Launch of Nokia's $20 phone begs question: Is one mobile enough? 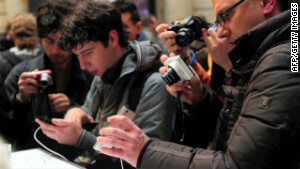 Barcelona, Spain (CNN) -- Is it time to start carrying two mobile phones? With the launch of a new no-frills handset, at least one manufacturer is hoping more people might soon be relying on multiple mobiles. Unveiling its cheapest ever mobile phone, a $20 handset with a 35-hour battery, Nokia said the device's extraordinary staying power could make it popular as a backup for when our main handsets run out of juice or prove too bulky to carry around. As he touted the Nokia 105 at this week's Mobile World Congress in Barcelona, an annual showcase for the newest hand-held gadgets, the company's chief executive Stephen Elop suggested that the time has come for some of us to be using two phones. While some might balk at the idea of filling their pockets with yet more technology, the enduring popularity of some existing low-priced models suggests Elop could be right. Modern mobiles might be capable of all sorts of trickery, but thanks to power-hungry screens and processors, many are incapable of staying switched on for long, despite the aid of various apps designed to wring out every last drop of battery power. Not so Nokia's 105. Although this barebones device offers none of the internet connectivity of most modern phones, it will be able to sit on standby for more than a month between charges. The handset, which also features a dust and splash-proof keypad and an FM radio, has been primarily launched as a low-end phone that would appeal to customers in the developing world who may have infrequent access to electricity. Nokia hopes that by focusing on budget as well as top end users it can reclaim ground from rivals such as Apple, Samsung and ZTE who have in recent years undermined the Finnish multinational's previously dominant position. Elop, Nokia's chief executive, told CNN his company hoped other budget models such as the Lumia 520, which includes top-end features such as internet and email access and a camera but a lower-end price of about $180, would help it corner this market. Nokia isn't alone in targeting this sector. Earlier this month Microsoft announced a partnership with Chinese manufacturer Huawei to create a sub-$150 smartphone specifically aimed at developing markets in Africa. But elsewhere in the world, Elop said his cheapest device would appeal as either a failsafe that users can turn to when their smarter handsets are struck dumb by power outage or as a novelty stand-in for costlier, bigger devices. "For some people it is their first mobile phone in an emerging economy for example," he said. "For others it might be the device they toss into the glove box of the car as a backup device or maybe something retro chic that they might carry with them to a party and slip into a clutch instead of their larger smartphone." Of course, Nokia's 105 isn't the only no-frills handset on the market. Many manufacturers continue to produce phones that retail so cheaply that some are treated as disposable. It might be the device they toss into the glove box of the car as a backup device. Over the past three years, Alcatel's OT-209, for instance, has sold in steady numbers to users lured by pre-paid package deals that cost just a few dollars a month. But none of these boast the 35-day battery life that would make them suitable for an always-on emergency standby. Elop is no stranger to multiple mobiles, admitting to CNN that up to 15 devices usually accompany him on his travels, although these are usually consigned to his luggage. "Normally in my pockets I have four or five," he said, adding that his array of handsets usually included rival models that he carried around to keep tabs on Nokia's opposition. But he declined to reveal the contents of his pockets to CNN on the grounds that at least one of the devices could be a Nokia prototype that needed to stay under wraps.